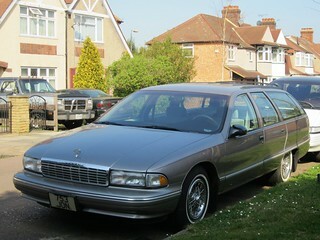 1995 Chevrolet Caprice 5.7 Estate. I absolutely love these things, such an American esque design, and probably very decent load luggers as well. Imported into the UK in the year it was new, it was also in very decent shape as well, shame it didn't have the woodgrain down the side but I think that was a feature for the Buick Roadmaster only, but the whitewalls are a nice touch without being too tacky.